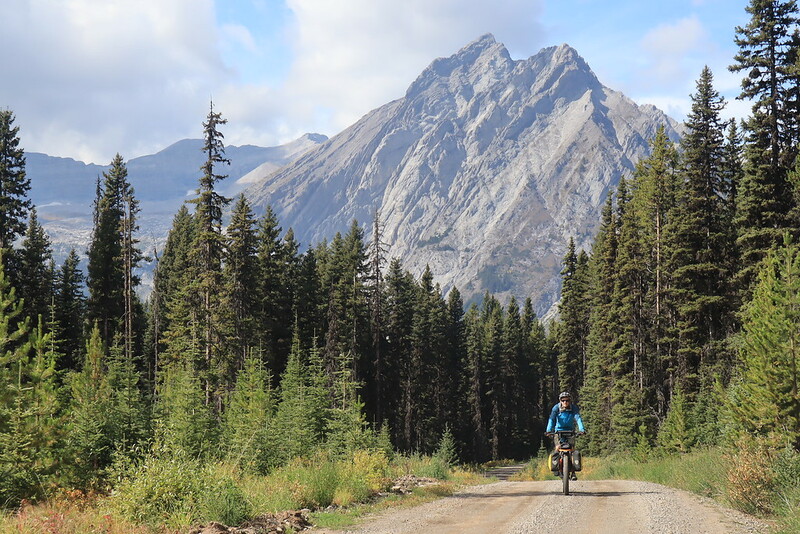 The world's longest mapped mountain bike route: how could we not want to ride it? Once we set on our minds on it, we were going to make it happen - or give it our best shot. 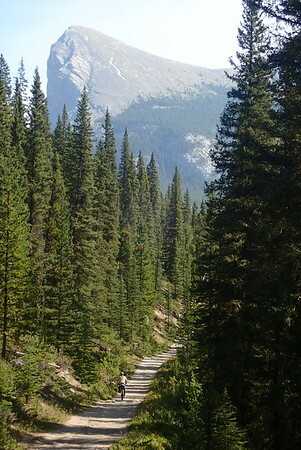 The Great Divide Mountain Bike Route is a mountain biker's version of the Appalachian Trail or the Pacific Crest Trail. It runs along the spine of the Rocky Mountains and links together 4962 kilometers (3083 miles) of dirt roads and occasional singletrack. It starts in Canada a few hundred miles north of the US border and passes through Canada, Montana, Idaho, Wyoming, Colorado and New Mexico before it ends at the Mexican border. 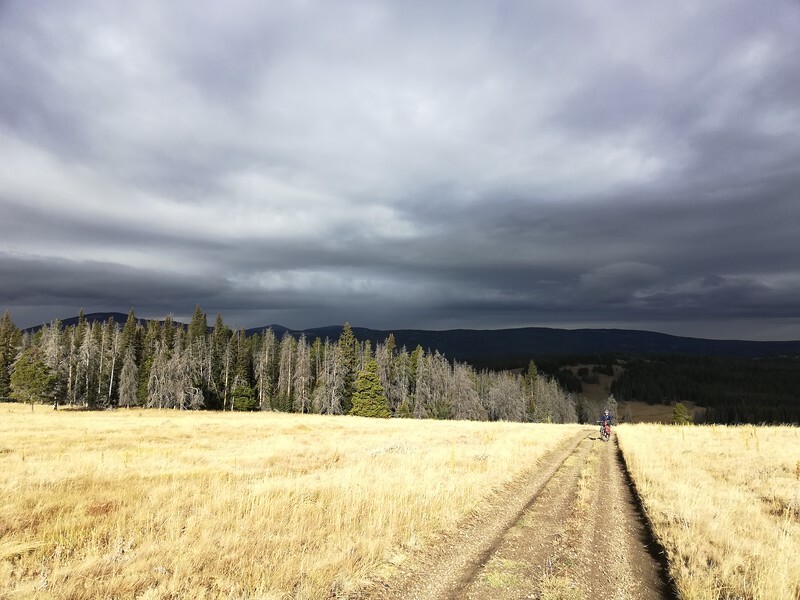 Riding the whole thing means gaining a cumulative total of 61'000 meters of elevation gain and crossing the geographical continental divide 30 times. The route was developed over 20 years ago by a few dedicated individuals at the Adventure Cycling Association and has also become the site of an annual race. Both men and women record setters have completed the entire route in under 16 days and many still do it within a month! On the other hand, the guidebook suggests 70 riding days - not counting rest days - which sounded more sensible to us. Despite this 'leisurely' pace we still ended up feeling like we were in a race of our own against winter. 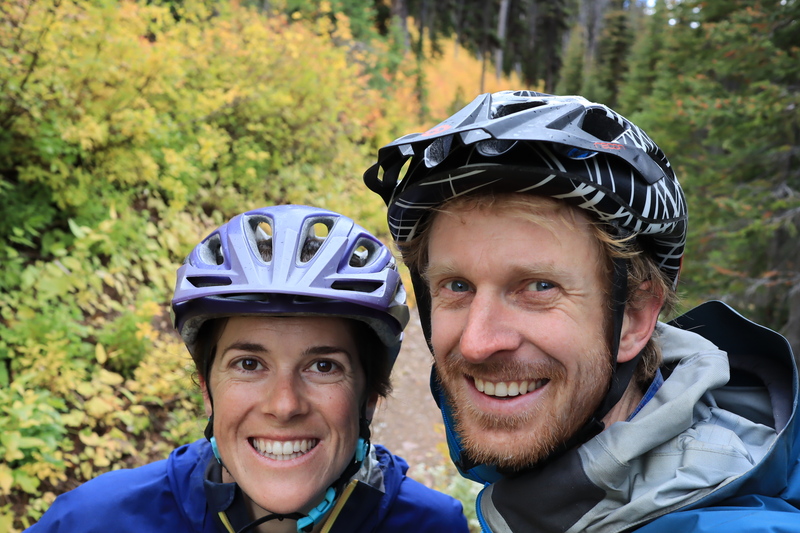 Here is the story of our time on the trail, written up some months later. We were so excited to start the trail that we set off for our first day just as soon as we were ready - at 6:30 o'clock.....pm. It had taken longer than expected to take care of last minute details. As soon as we started riding we were enchanted. The views were tremendous for all of the first few days, only partially veiled by smoke haze on one day. 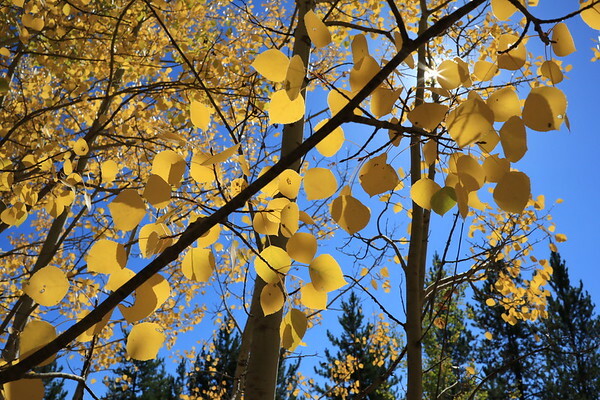 One advantage of starting this trail as late as September is that we missed the peak of wildlfire season. 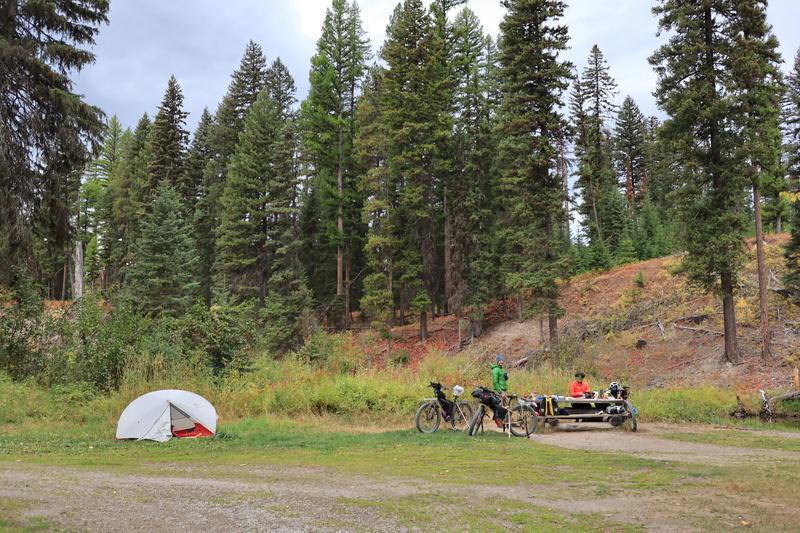 We especially liked the network of singletrack trails around the Lower Lakes Campground that we added in to our route before tackling Elk Pass. Campgrounds along the route provided varying levels of amenities - and memories. In Canada a Swiss couple traveling by RV invited us for an "apero" of white wine in real glasses, other nights we had fun hanging out with other riders, or we simply watched the mist circle the trees from a tranquil riverside spot. One night a local man saw us pull into a campsite near his cabin in the woods and came back with rum and coke to share with us in the rain. 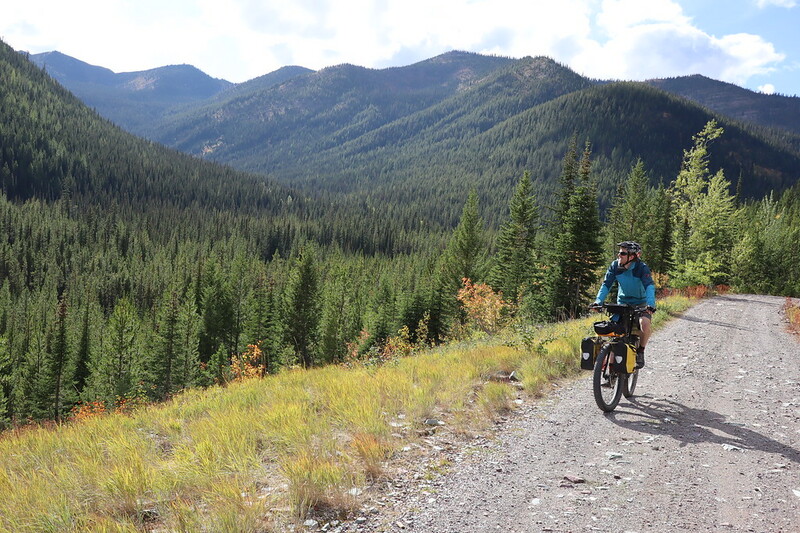 In the first week on the trail we rode through beautiful Canadian national and provincial park lands, then through a few mining towns where the scars of mining are visible on the hillsides, and eventually through a forested wilderness called the Flathead Valley. 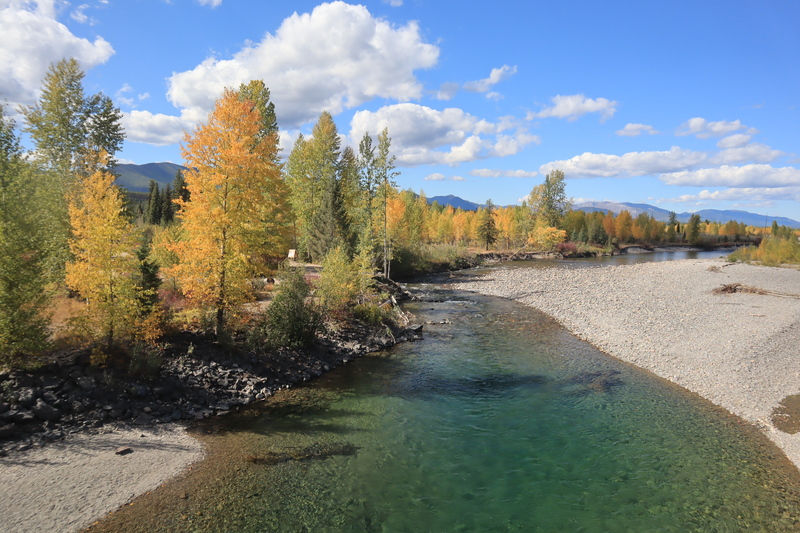 The guidebook made a strong case for taking the "Flathead alternate" rather than the more direct route past the town of Fernie. Describing it as a wild utopia full of wolves, bears, elk and more convinced us we wanted to see it and off we went on our first detour. 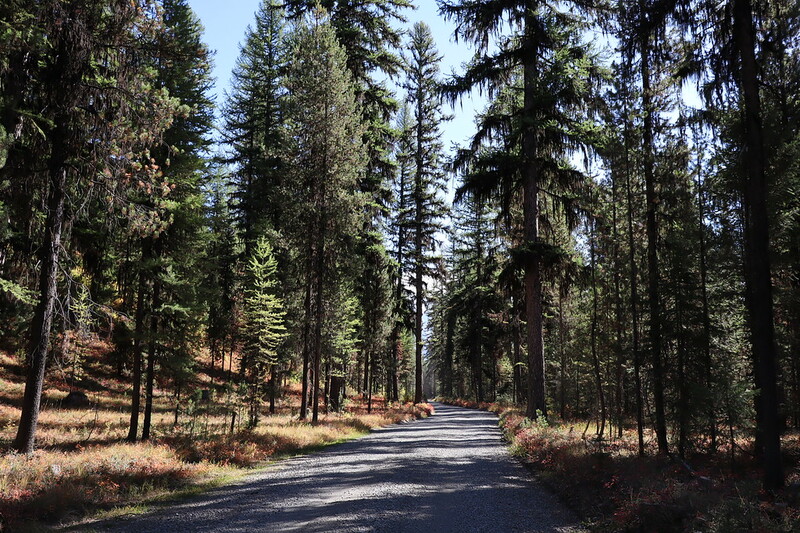 We were certainly in the midst of a dense and remote forest for days, but unlike being in a national park, there we were on logging access roads where the regular signs of logging and hunting took away that wilderness feeling for us. On the second morning into this voluntary detour the freezing rain sent us scrambling up a hillside to huddle under a tree for shelter. 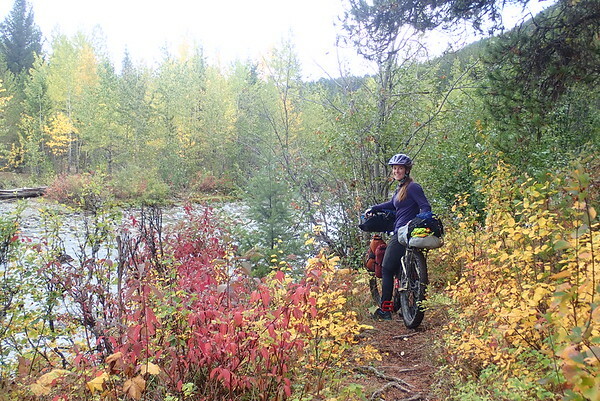 Though we nearly turned back to pick up the normal route, eventually we were glad we continued, because the sun later came out and the rest of the Flathead Alternate did reward us with a beautiful river-side campsite and some lovely singletrack among pink dogwoods. Also, we now get bragging rights for doing "The Wall", an insanely steep trail section that is famous on the Great Divide and requires unloading the bikes and pushing and dragging each one up the hill together. 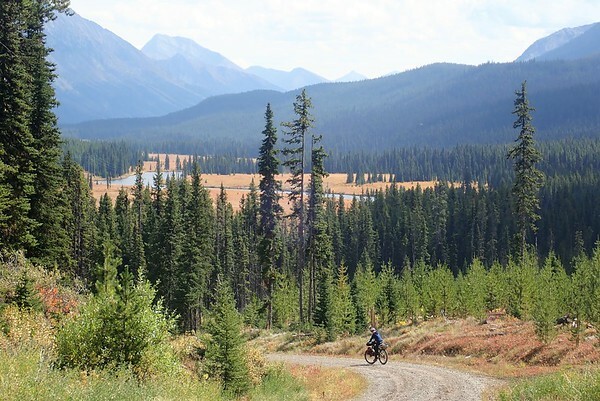 Nonetheless, we have since heard that the other option would have included miles of newly built singletrack and that the Canadian town of Fernie was well worth a visit. Entering Montana was golden. Evening light stretched across grassy hills and illuminated barns, fences, cows, horses and the huge sky. It delivered exactly what I had hoped for ever since seeing the movie The Horse Whisperer when I was 15. As we arrived in the quaint town of Eureka on a Friday night we could hear a crowd roaring from the high school football stadium - typical of "small town America" . We had planned to rest for a day in Eureka because we realized we had launched into the Great Divide a little too hastily from the previous chapter. 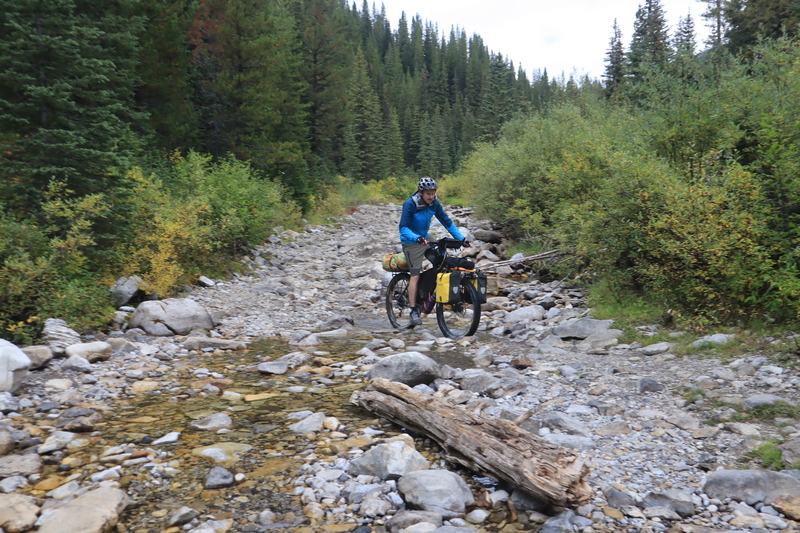 However, we had started to realize over the previous months that two nights in a place only gives you one day off the bikes to wash clothes, dry out damp gear, stock up on food, maintain the bikes and any other broken bits, deal with any online admin, etc. So we started taking longer rests: a day for chores and then a day to actually rest. Spending three nights in one place so late in the season may have been an indulgence, but having time to process what we have experienced and replenish our energy (and calories) is essential for us to be in the right state of mind. 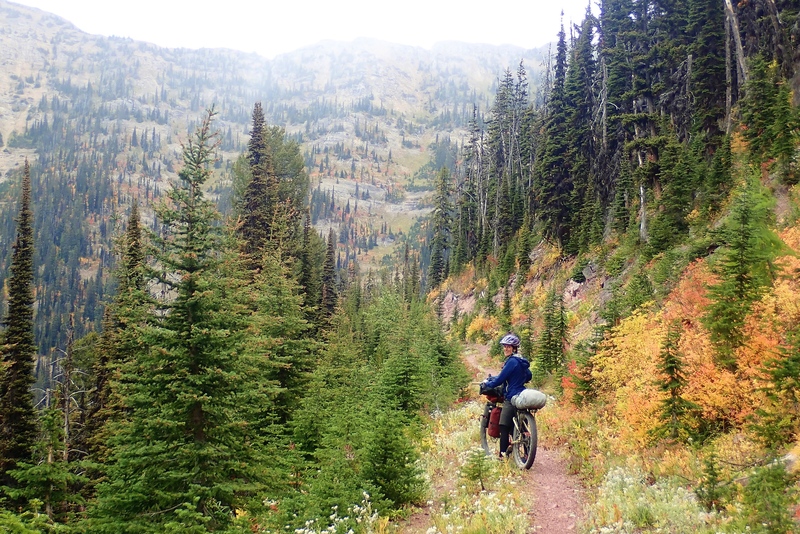 The next section quickly rose out of the golden ranch-country and in a way felt wilder than the Flathead Valley. We saw a river filled with bright red salmon and a huge bull moose on the first day out of Eureka. 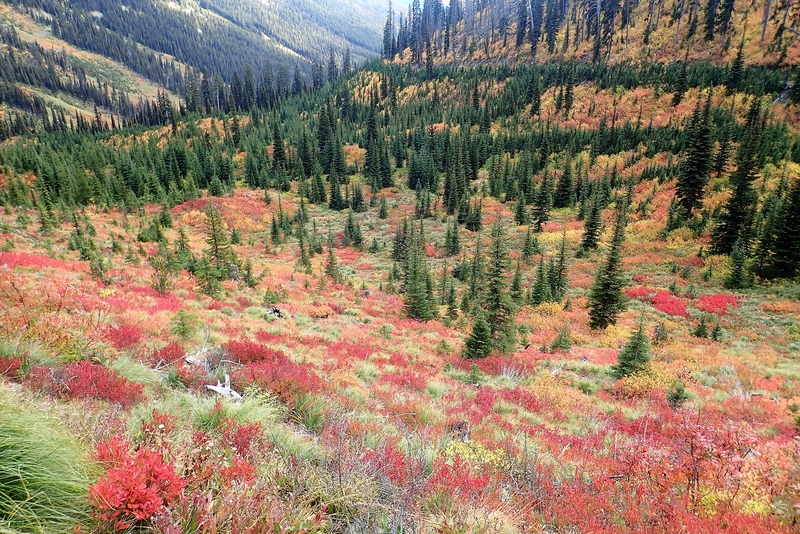 Over the next few days there were signs of bears everywhere, giant larch trees, and plenty of fall colours to keep us dazzled. 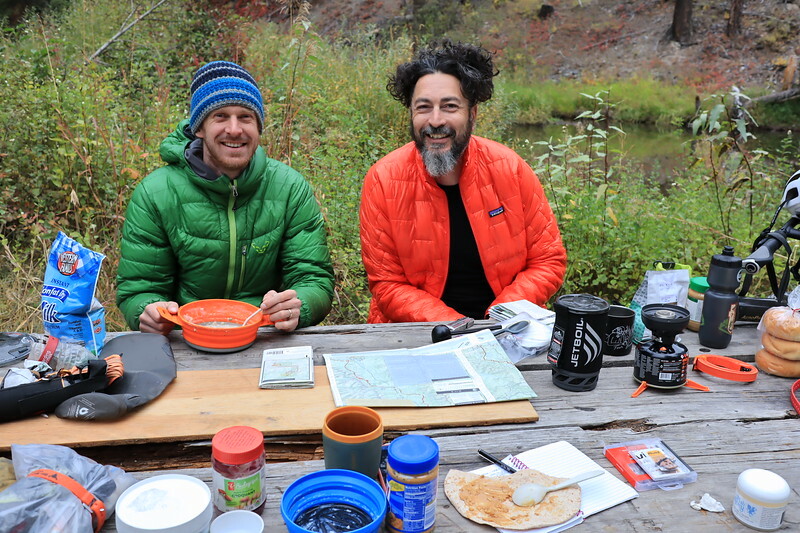 When we arrived a few days later in the very cool town of Whitefish, we were looking for a place to have lunch when a woman approached us to say that if we needed a place to spend the night we were welcome to camp in her yard. She gave us her address and a few hours later when our other accommodation plans had fallen through we knocked on the door of a beautiful house to see if she had really meant it. 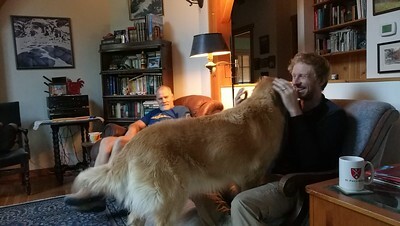 Luckily she seemed genuinely pleased we had turned up and even invited us to stay in her son's bedroom since he had recently left for college. Heidi and her husband Mark haven't ridden the GDMBR nor are they registered on Warmshowers, but they had taken other riders in before and just liked the idea of helping out. Over amazing home-made hamburgers they told us about their work and their teenage kids' impressive adventures. 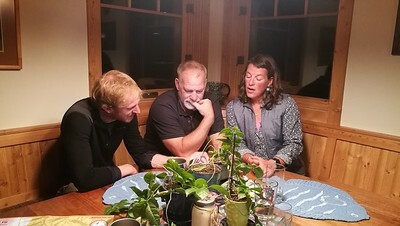 Their son was part of a team charity bike ride across America and their daughter had recently spent a few weeks on a group biking trip in Europe. 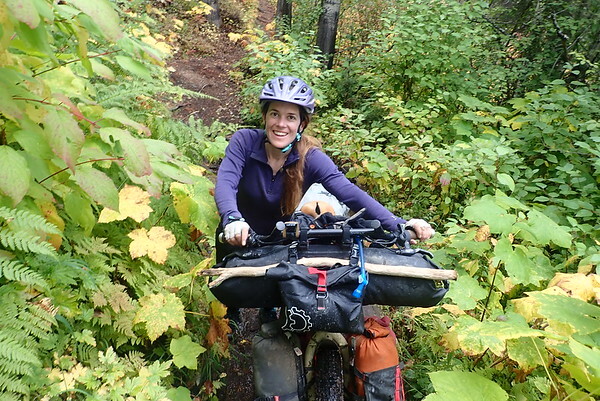 Heidi is an instrumental figure in conservation and trail access for the area, working with private land-owners to develop new trails and work with different stakeholders to ensure access (the kind of work I'd love to do one day). She was modest about it but at the bike shop the next morning they praised her hard work. From the inside of the house we were able to admire the excellent workmanship and carpentry that Mark had done himself, having built this house as a showcase for many others he has built in the area. What a cool family! Whitefish was such a lovely town it was hard to leave. We ate a huge pancake breakfast at a great cafe filled with local art (Loula's Cafe), then while we left the bikes at the shop for some minor upgrades we wandered in and out of bookshops, gear shops and art shops - eventually leaving town around 3pm with a new journal for Julie, new charcoal pencil for Adam, and a new collapsible pot to replace our metal one that had been leaching suspicious grey stuff into our meals. We rode the next seven days without a rest day, finally feeling strong and in the groove. We really loved this section and enjoyed riding some of the days with Jayme, another rider who became a friend on the trail when we started crossing paths every few days. South of Whitefish our route followed country roads past sprawling ranches and then into forest where we noticed the popularity of Private Property and No Trespassing signs. Some places even warned potential trespassers to say their last prayers - the message was loud and clear: these rural Montanans wanted to be left alone. 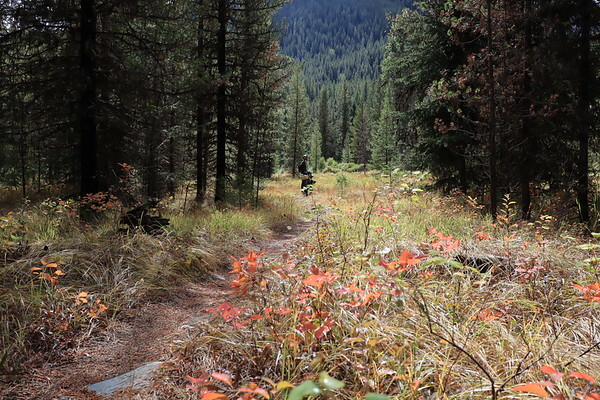 Once we climbed up into National Forest land (another category of land protection that allows for recreational use, including hunting) Montana felt extremely wild. 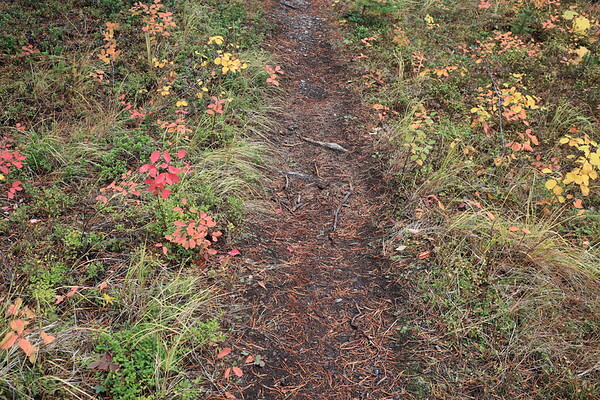 We frequently saw signs of bears and moose and continued to shout "Heyyyy bear! Yo bear! Coming through bear!" if we were coming around blind corners or in dense brush. There were long climbs, sometimes in dense forest but often with grand views. On one climb Adam saw a black bear run across the road and I caught up only just in time to hear the thumps of its footsteps as he ran into the bushes. As we made our way along the trail it was mind-boggling to imagine racing it, especially when we learned that some racers ride 18 hours a day and sometimes more - riding at full speed through the night, taking their chances with possible encounters with bears, and often sleeping on the side of the trail without a tent. 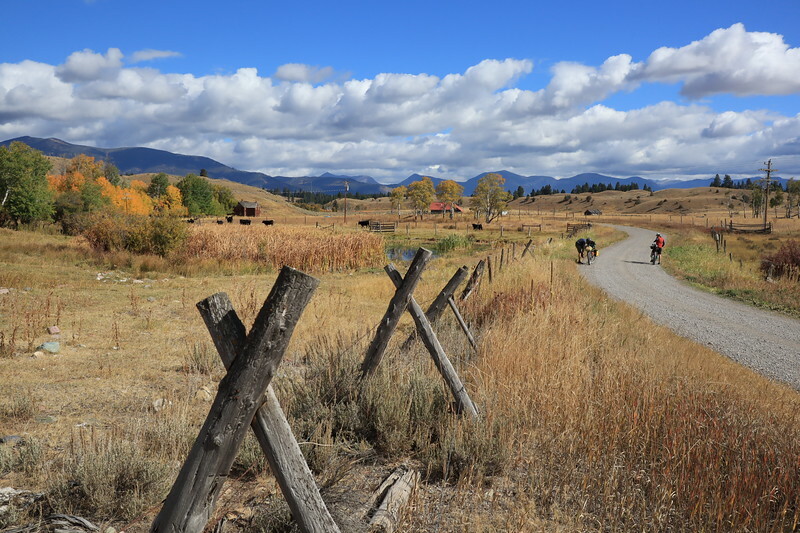 The town of Ovando, population 50, is a special place for the GDMBR and especially for the race, called the Tour Divide. We learned that after most of the town burned down decades ago, it had been slowly dwindling and nearly disappeared. However, when an exhausted and hypothermic Tour Divide racer showed up in the middle of the night many years ago the town's residents put her in the abandoned sheepherder's wagon to rest and took care of her until she regained her strength and continued to finish the whole race. From then on they realized this was an opportunity for them, and they have since moved the old jailhouse into the center square as another option for weary (or desperate) bikers to sleep in, added a tipi and set up an outdoor webcam so that all the riders can get their photo taken even if they come by in the middle of the night. In the morning we watched the goings-on while making our breakfast outside the sheepherder's wagon we had slept in. There were just three businesses on that square: a general store with flyers in the windows in support of the NRA and a quote on the wall in favor of gun ownership, an organization ensuring compensation for ranchers whose livestock were taken out by wild predators, and a fishing tackle shop run by a very liberal woman from California who was an outspoken critic of hunting. Eclectic to say the least. Two days later we pulled up to a colorful welcome sign outside a house with llamas and alpacas in the yard. 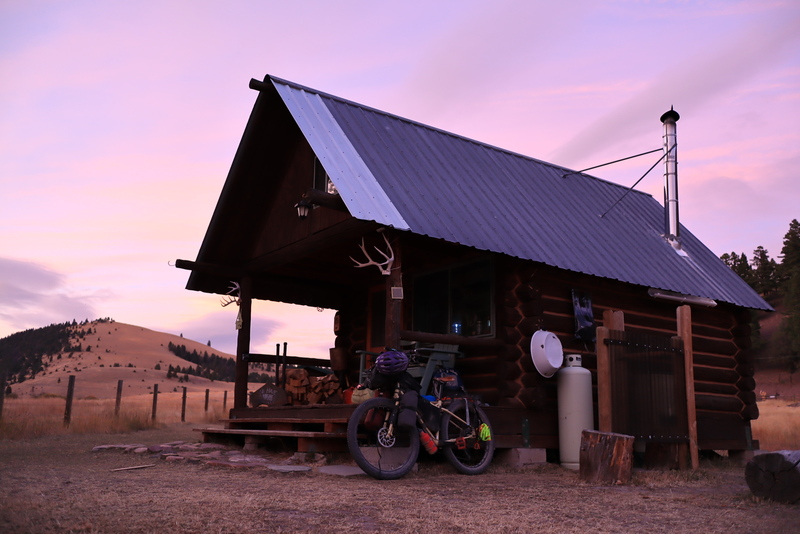 We knew this was "Barbara's place", because she is mentioned in the guidebook as a place where riders can spend the night, but we didn't know just how special it would be. Since the start of the race some 20 years ago Barbara has been gradually improving and increasing the offerings for riders. She even bought a wooden cabin that was going to be torn down on a nearby property and had it installed on her land. She now has two cabins, each stocked with pouches of curry dinner, pancake mix, M&Ms, granola bars, and even wine. She restocks the cabins with fresh water and sheets every time there are new guests - and she refuses any money at all. She just wants her visitors to "pay it forward". We and Jayme were her only guests that night but she has space for at least eight people in beds or on cots in tents, and plenty more in the yard. She has had up to 14 at one time. 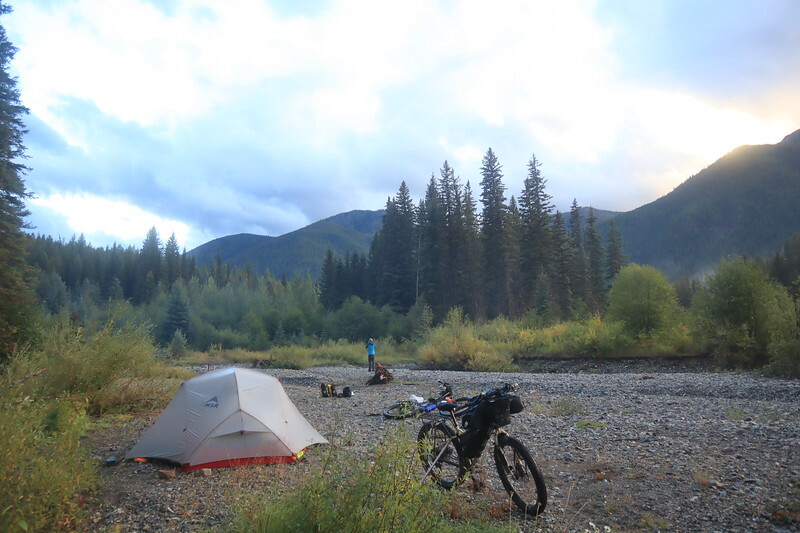 A few years ago a rider passed by in the afternoon heading north but wanted to reach another campground that night. 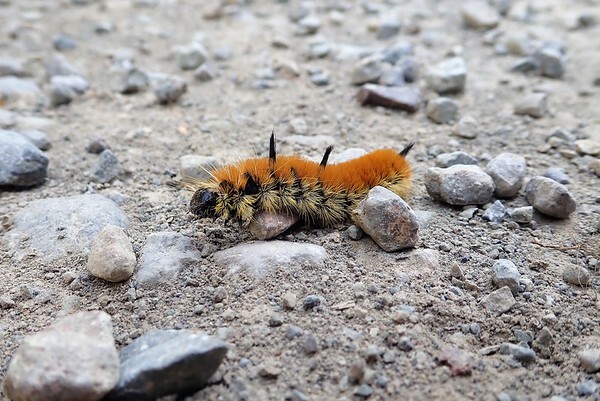 However, it was forecast to rain and he decided that if it started to rain within two miles of the house he would turn back, if he was any farther he would just continue. As the sky broke open on him he looked at his odometer and he was 1.9 miles away. He turned back to go ask for a place to spend the night at Barbara's - and over the next few days they fell in love. John finished his ride over the next few weeks, but came back and moved in with Barbara and three years later they now host the riders together. We were just coming up to say goodbye and thank them for the comfortable stay when they invited us in for breakfast. Over scrambled eggs and toasted bagels, they told us that they want to use their few acres spread kindness and that they hope it can have a ripple effect through their guests. 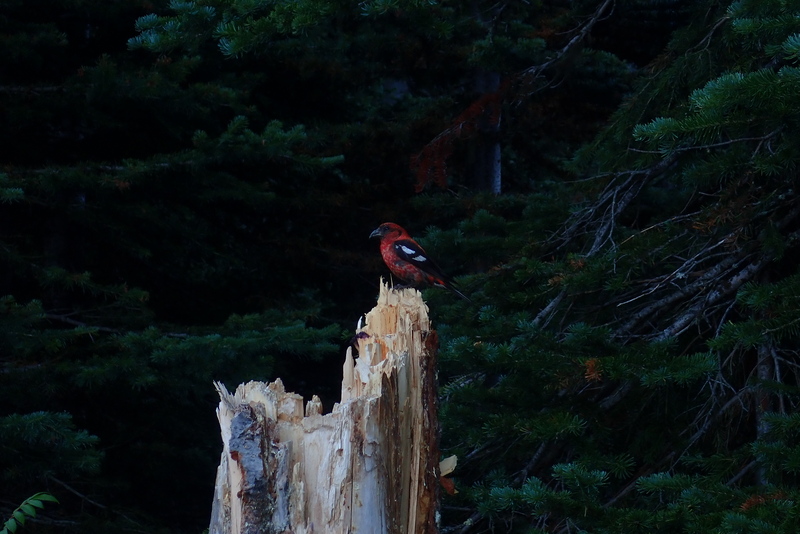 Our stay there was one of the highlights of our Great Divide trip - thank you Barbara and John! ​​​​​The day we left Barbara and Jon's we had a big climb before we'd get to Helena, a biggish city and the state capital. The grey sky spelled cold and we each pedaled at our own paces, heads down, pausing only briefly now and then to avoid cooling down. At the top of the pass I even put on an extra pair of socks for the descent. The reality that winter could really be around the corner was starting to hit. 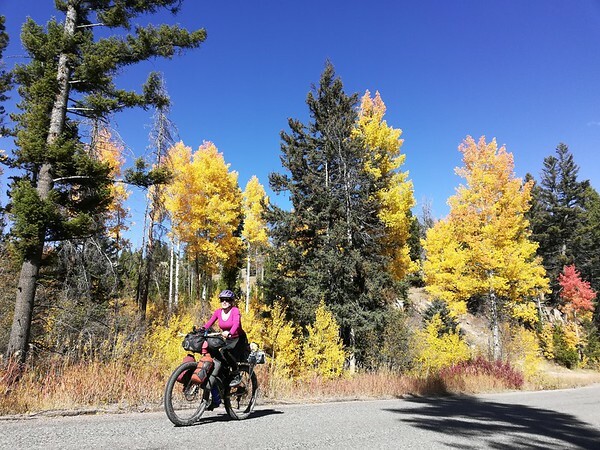 During our rest days in Helena we avoided a snowstorm that turned the town white for half a day, but we set off again hopeful that there would be plenty more autumn days ahead for sunny riding. Little did we know that five days later we'd be huddled and shivering uncontrollably under the porch of an outhouse as freezing rain turned to snow and back to rain while night fell. But before all of that, the Great Divide served up more brilliantly-hued rides and insights to American culture and its mining history. "Big Sky Country" is the motto for Montana and I think it represents what draws many people there - a sense of open space and freedom. A few people told us this was why they had come to Montana. 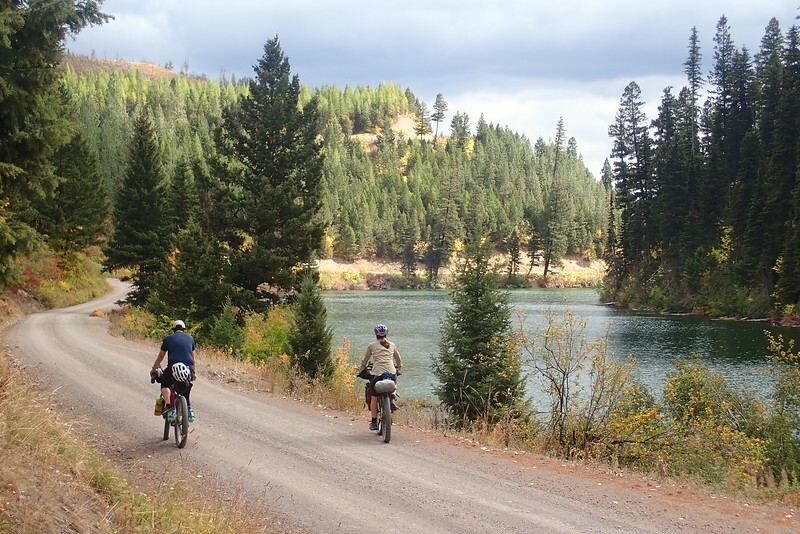 We rode out of Helena through a narrow 'gulch' (ravine) lined with abandoned wooden lime kilns and past houses with spacious picturesque yards - the kind with tire swings hanging off of huge tree branches and tractors parked in the driveway. 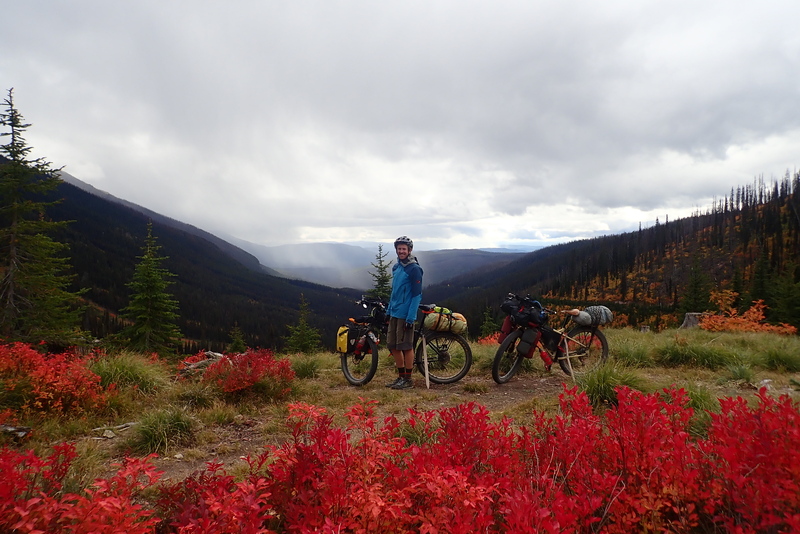 The fall colors were still in their prime and looking around trying to take in all the colors and shapes helped pass the time as our legs turned the cranks round and round to the top of another climb. 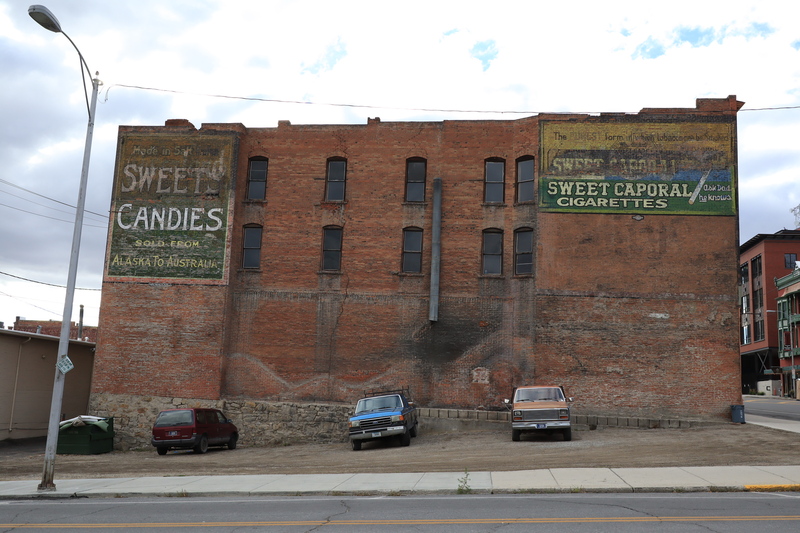 A couple of days later, Butte's historic houses and brick buildings inspired some street photography, but the grandeur of the buildings didn't match the emptiness of the streets. It seemed like its heyday had passed - but from the looks of it must have had a heck of a heyday. Decades-old advertising murals still color the brick walls in faded tones and some of the grand hotels have kept their names in huge letters on the roofs - though others have been converted into noisy sports bars. But the most dramatic feature of the city is the enormous open mine that towers over the city. The mine is so big and blatant that they sell postcards of it. They also offer guided tours to see this pit that is being gradually filled with toxic water since a clean-up solution has yet to be agreed upon. The city grew on the profits of gold, silver, copper and other metals, but it is paying the environmental price. An eyesore for sure, and more importantly, a shame to think about the health effects for the people there, but despite the mine, I thought the city of Butte was a great example of the exuberance of America that is both charming and brash at the same time. The memorable parts of the next two days of riding were the vibrant yellow leaves, starry skies, a frosty morning, and a hill so steep we had to push our bikes down it. 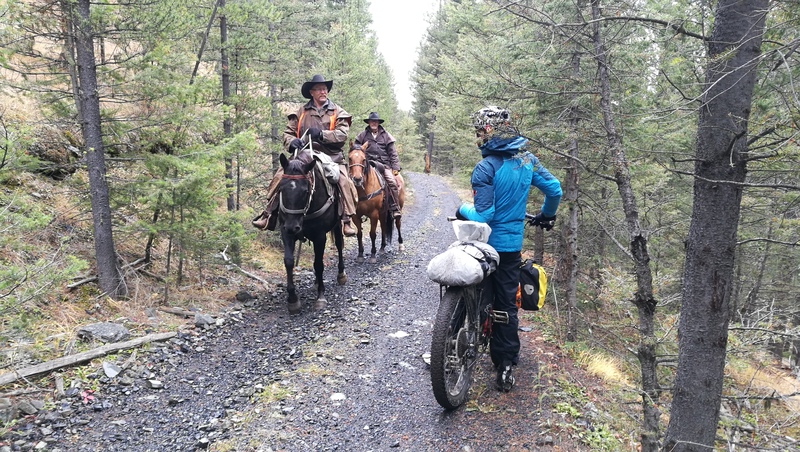 We also met some real cowboys: when we slowed down for two men riding their horses up the trail we noticed they were in full leather riding chaps and cowboy hats and I am sure this caused us both to come to a sudden stop: we just needed to hear their story. As Adam asked what they were up to I grabbed a quick photo of this classic wild west trail encounter and they told us they were cow-hands heading out to round up about a 1000 head of cattle spread over 100 square miles. And later that day is when our Great Divide adventure came to a soggy end. The $1 coffee with free refills in the gas station convenience store in Wise River must have filled us with a false sense of confidence because we decided to keep riding after lunch even though the forecast predicted a week of temperatures hovering around 0 celsius in the valleys, and a route profile that would not dip below 1800m for few hundred kilometers. About two hours later it started to rain and snow we agreed to choose an earlier campsite. About twenty minutes later I waved frantically from down the road where I was lagging behind to ask Adam to stop and pour some chips into my mouth so I wouldn't have to take off my gloves. And about 30 seconds after that I felt the cold creep up my arms and into my torso and I knew I was in trouble. I simply couldn't warm back up and that is how we ended up shivering under the cover of an outhouse (and to top it all off we burned our dinner). The next morning while waiting for the ice on the roads to melt we contemplated whether to push on or not, but too many of our already limited set of clothes were wet, so I put a bread bag on one foot and a dry-bag on the other for warmth and we rode 25 miles back to Wise River. We were studying the map for a shortcut back to Butte over breakfast hamburgers (very necessary) when the restaurant owner said he could give us a ride in his pick-up truck. With a huge sense of relief we then both admitted to each other what we had been secretly brainstorming: renting a car and heading south to warmer temperatures as fast as possible. 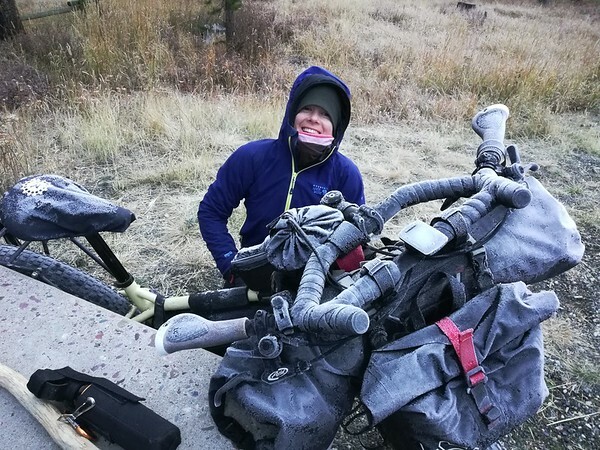 We also wondered if Jamie and Gabi, who we had met two months back in Haines, Alaska and had been riding about two to four days behind us on the Great Divide had arrived in Butte yet and if we might talk them into the same plan. It turned out they were thinking the same thing and as soon as our cell phone had reception we received a text from them saying they were about to rent a car. The next adventure that ensued will be the subject of another blog post - and one of the highlights of our trip. 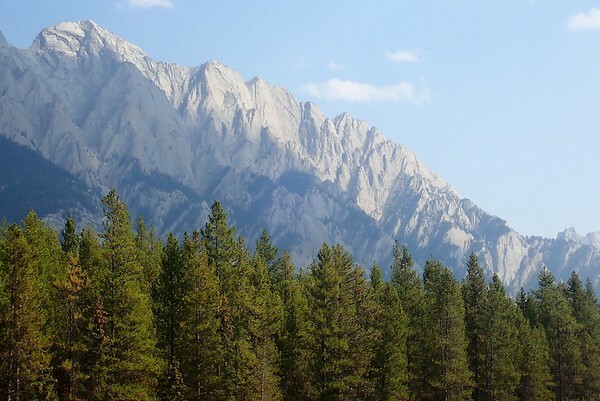 In the months since the Great Divide we have reminisced often about our magical time in Canada and Montana and both agree the Great Divide just has a special something to it. 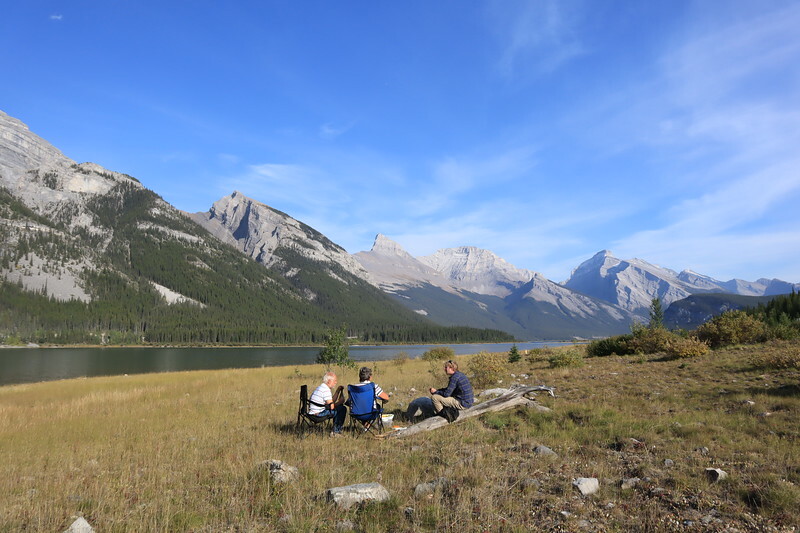 It is an amazing route that brings you up close to beautiful scenery and wildlife - but there is more to it than that - here are a few of our reflections about the magic of the Great Divide. The first is that we were following a precise route, even down to the suggested daily mileage from the accompanying guidebook. We bought the digital map file (GPX file) from the Adventure Cycling Association (ACA) which included points of interest, places to get food, bike shops, campsites and pretty much anything we would normally have to figure out for ourselves. 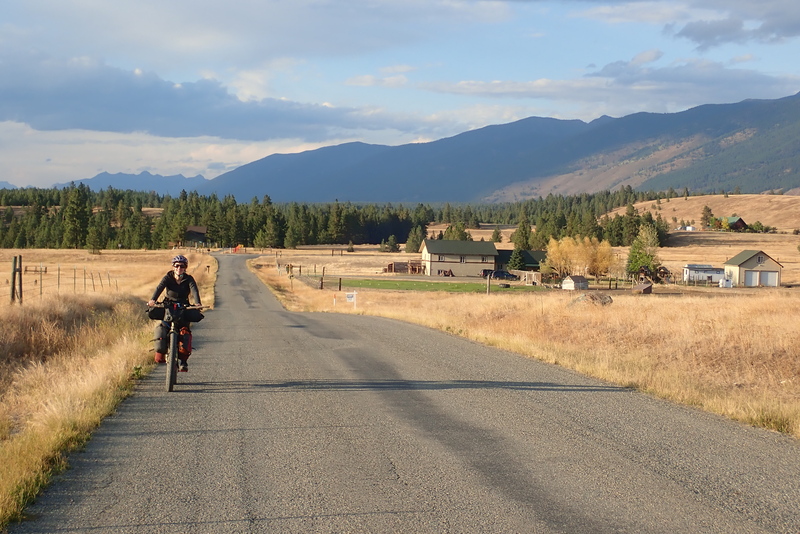 Rather than feel we were being unadventurous by following in the footsteps of thousands of other riders, we loved the energy that was freed up by not having to spend so much time planning each day. By following in others footsteps we alo got to feel that we were part of something bigger. There was a sense of a community connected through space and time by this trail - and a sense of history of being on a long trail that took so much effort to develop. All along the way people would stop and ask if we were on The Divide or tell us stories about other riders they had met in previous years. While many shook their heads in disapproval for us being there so late in the season, many encouraged us. However, the "trail angels" really brought the spirit of the Great Divide to life for us. The people who took us in for the night usually did so because they understood that for many riders, taking on the Great Divide is not just a fun physical challenge, but often a personal journey, and so they open their doors to strangers with this unspoken permission that it's okay to show up tired, dirty, smelly, hungry and oversaturated with emotion. Being received like that is such a gift - and one we hope to reciprocate to other travelers in the future. We had been genuinely hopeful that we might get lucky with a long fall and a late start to winter, and I have occasionally caught myself thinking we could have ridden on had we been prepared with more winter clothing. However, I'm glad we stopped when we did so we can return and enjoy it section by section when the weather allows. Thank you to everyone who makes the Great Divide what it is: the ACA, the author of the guidebook, Michael McCoy, the organizations and people who ensure that bikers can still access these lands, the hosts and trail angels along the way, the enthusiastic onlookers who encouraged us - and of course the other riders who keep the trail and its magic going just by going out and riding there year after year.